State of the art, highly luxurious seafront apartment by top designer complete with designer furniture, top of the range appliances and full amenities such as Broadband wireless internet, satellite T.V with 50 " LCD screen, cordless digital telephones and an ice making machine,and now the very best and latest espresso machine. Fresh ground coffee every morning . Enjoys breathtaking views of the fortified peninsula of the capital, Valletta and its surrounding yacht marinas. Beautifully floodlit at night, it is considered by many as one of the most beautiful views in Europe. The design of the apartment allows sunlight to brighten and warm up the rooms through its sheltered location even in winter.Fantastic new shopping mall The Point a few meters away. Full central heating and air-conditioning in all rooms. Located within minutes of boat cruises, buses, taxi stands, shops & restaurants. Weekly maid service included, complementary food & drink pack on arrival. The Island of Malta region: Megaliths, medieval dungeons and Calypso's Cave – The Maltese Islands are positively mythic. The narrow meandering streets of their towns and villages are crowded with Renaissance cathedrals and Baroque palaces. As the countryside is dotted with the oldest known human structures in the world, the Islands have rightly been described as an open-air museum. The Maltese archipelago lies virtually at the centre of the Mediterranean. With superbly sunny weather, expansive beaches, a thriving night-life and 7,000 years of intriguing history, there is a great deal to see and do. With a little help from any guidebook, captivating places of interest are immediately identified – the world famous Hypogeum selected as a place of World Heritage by UNESCO, prehistoric temples and grand palaces are but a few. How to get there: Brithish Jet and RyanAir fly to Malta on low cost daily flights from the UK and Ireland. Malta's national airline, Air Malta have numerous scheduled flights daily from Heathrow and Gatwick besides several other frequent flights from several UK airports, like Manchester, Birmingham and Glasgow. Airmalta has scheduled flights from practically every country in the EU. The Maltese Islands are not very large, which makes getting around relatively trouble-free. A regular ferry service links Malta to Gozo, taking about 20 minutes each way. I am an owner of an optical company called K-Optics and also purchase seafront apartments and love doing them up and most importantly having satisfied guests . This property in my opinion is without any doubt one of the most beautiful rental direct seafront apartments in Sliema and in the best residential area having all you may need just around you . The interior also is superb . We have been in the rental business for many year so we know how to make our guests as comfortable as possible . The view is outstanding and one of the best on the Island . What makes it unique is that the view is also beautiful at night because the Valletta fortifications across the bay and Fort Manual are all subtly floodlit . The apartment also has a 33 foot frontage and the balcony is seamless with the internal rooms giving the feeling of space and light a different meaning . It is also a few meters away from one of the best shopping Malls on the Island ,beach Lidos and ferry boats . Location is great. Near bars and restaurants with the Point Shopping Mall just a couple of mins walk away. The apartment is on the third floor and is accessible by lift or stairs. It’s very tastefully decorated and furnished with a chic modern look. The view from the balcony is amazing. Lovely just to sit with a drink and watch the world go by to the backdrop of the Valletta skyline, especially when the sun is going creating a lovely golden glow on the buildings. Clifford the apartment manager was very helpful and answered any questions we had. He also supplied beach towels at very short notice and organised a taxi for our return to the airport. We didn’t do any cooking in the apartment so can’t really comment on whether the kitchen appliances work or not but it looks like there is everything there for your requirements. Couldn’t see how the ice maker worked so never perserviered. We bought a bag of ice from the supermarket at the Point. All in all a great apartment in a great location. Would stay again and would happily recommend. Great setting looking out onto Valletta, 5 minute walk to buses and ferries. Good restaurants all around and it is a very well equipped, comfortable apartment. Perfect in October but I think it would be a bit hot despite the air-conditioning in midsummer. The flexibility to check in a bit early was greatly appreciated. Would have earned 5 stars if the electricity wasn't funky (the breakers trip if too many AC units or lights are on) and if there had been a second set of keys. Great apartment: modern, spacious, clean and very comfortable. All that and view that makes you want to just stay in the apartment. When you do venture out, transportation by ferry or bus is nearby. The apartment is also in the middle of a shopping and restaurant area (recommend Ta Kris-make reservations). The apartment is expertly managed. The owner and house keeper both take a lot of pride in the apartment and are easy to contact. They will arrange transportation to and from the airport. Also, a reasonably priced driver can be arranged for the day, but make arrangements early. I highly recommend the apartment. Right from our first enquiry last year, Keith ( the owner) has been excellent in communicating queries etc regarding the booking and appartment. 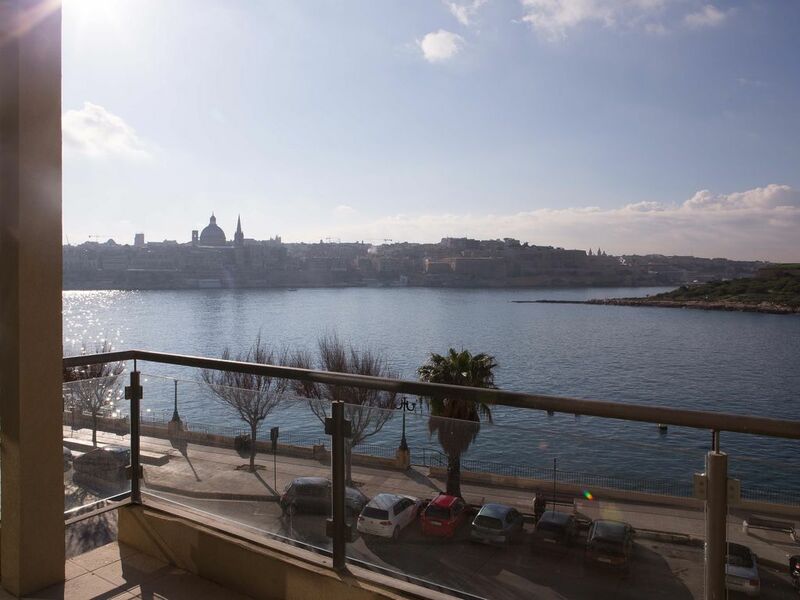 The appartment is very well located in Sliema with wonderful views of the harbour and across the bay is Valletta ( easily reached by the frequent harbour taxi) Close to the appartment is the newly built Tigne Point shopping centre with a supermarket. We arrived on Sunday so this was closed but Clifford the ' handyman' left food for breakfast and milk tea coffee etc . Appartment was spacious, airy, clean and all we could have hoped for. All items described were present. Beds were comfy, if a little soft to my liking. Ample towels were provided as well as beach towels. Washing machine was used and works well as is also a dryer. TV was excellent sized flatscreen, channels in English were slightly limited but we mostly plugged our iPads in the HDMI socket ( take an HDMI lead with you)and watched films at night. Sockets are same as in UK so no adapters needed. Local restaurants were good, some were part of Fortina hotel next door but avoid their buffet restaurant , wasn't good and was expensive, both myself and wife felt it was more like a hospital canteen. Best restaurant we found was Cucina del sol, we ate their 4 out of our 7 nights stay, book Fri and Sat night as busy but other nights was fine. Most places in Malta are easily reached within 30 mins by car, we visited Medina, Golden Bay, Popeye Village, Valletta plus a cruise around Malta courtesy of Captain Morgan Cruises. The only disappointment for the kids was the waterpark is seasonal so closed till mid May but it didn't spoil our holiday. All in, we has a great week break from work and the appartment was first rate and highly recommended.Much better than a hotel. No real negatives. there was scaffolding up outside the building as it was being painted but we were told before our arrival and it didn't spoil the view much. Thank you so much for the great review and the detail you gave about the surrounding area and things to do for future tenants. Very happy to hear that you loved the apartment especially when you had the inconvenience of the facade being painted for which I apologize. Hope to see you all again and thanks again . Our arrival was delayed due to flight, difficulty finding hire car in park and more than a few missed turns, road signs aren't great in Malta, but we were warmly greeted and settled in quickly. Very central location for access to restaurants, supermarket and shopping. Any queries we had through the week were sorted immediately. Keith very accommodating, even on our departure when hubby left jacket in apartment, he sorted our return access. Thank you. Our fault it should be the women leaving last!!! Possibly update DVDs? Please don't change the views, they are stunning. Staying in Sliema then this is the place to be! 100 metres from the Point and 100 metres to the shopping area whilst overlooking the harbour. The accomodation is first class and Doris the housekeeper is a gem. Several places to eat, and located above a local bar. The food in Malta is surprisingly good. Meliaha, in the North, has the best and safest beach. Sliema is Malta's top up-market tourist destination, which caters for all tastes and ages. Whether it's sea, shopping, restaurants, pubs or great night-life, Sliema has it all! Sliema is also a few minutes by car to all Malta's major town's and just across the harbour from Malta's capital city, Valletta. Malta has had such a rich history that the country is practically saturated with attractions and places of interest. The capital city of Valletta host to regular plays and concerts, as well as scores of exhibitions and street events. The Museum of Archaeology in Valletta houses an exceptionally rich collection of prehistoric artefacts. The War Museum at Fort St. Elmo is home to a Sunday military parade in period costumes re-enactment and the capital also possesses the impressive Grand Master’s Palace and St. John’s Co-cathedral. With 7,000 years of history, the sites to visit are endless! 'The Royal Malta Golf Club is a private Members' Club founded in 1888. The club has seen many changes since its inception, when it was primarily set up as a facility for British servicemen stationed in Malta. Whilst essentially a members club we always try to give a warm welcome to all visitors who share our love of the game. We have invested heavily in the golf course over recent years and feel that our 'product' is coming together nicely with the next project to be undertaken by the Board of Management likely to be a refurbishment of our club house. Arrivals allowed in at any time if possible and departures to vacate by 11.00am. (Late departures negotiable) Deposit of 30% required on confirmation, while 70% on arrival . Preferred deposit payment methods are by a direct bank transfer to a U.K account or SWIFT bank transfer. Preferred balance payment methods are by cash on arrival.